Ontario Premier Kathleen Wynne says she accepts the findings of the auditor general in a report on the cancellation of a gas plant in Oakville, telling reporters that there are many lessons to be learned from what happened. 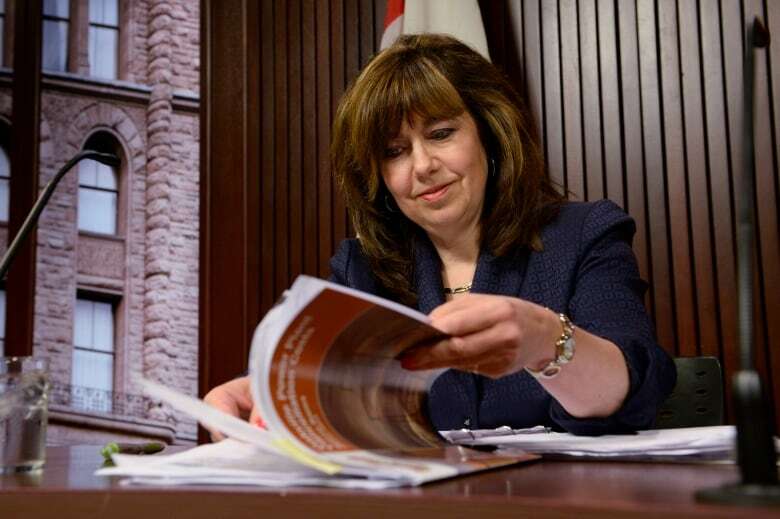 The province's newly appointed auditor general, Bonnie Lysyk, reported Tuesday that the cancellation of the Oakville plant will have a net cost of at least $675 million — and possibly as much as $810 million. Both figures well exceed the $40-million price tag that the governing Liberals had once claimed. When combined with the costs of the cancellation of a separate gas-fired power plant in Mississauga, Ontarians will be on the hook for up to $1.1 billion, the auditor general said. "Hydro customers will be paying higher rates for electricity in the future as a result of not only the cancellation of the Oakville contract, but also because of the [Ontario Power Authority] not being able to take full advantage of the terms within the contract that may well have enabled the province to get a better deal," she said. The province could have paid far less in penalties if it had let OPA negotiate with the developer, TransCanada Energy, without interference from the premier's office, which promised to fully compensate the company, added Lysyk. "At the time of the cancellation, the government appeared to tie its own hands by committing to keep TransCanada Energy 'whole,' by promising to compensate it for the full financial value of the Oakville contract," she said. After Lysyk’s report was released, Wynne said the projected long-term costs of cancelling the Oakville and Mississauga plants are "unacceptably large." Wynne said “money is too tight for tax dollars to be spent in any way that is not productive” and she pledged that similar decisions will not be made in future. The premier said that the government consulted with experts and had made plans to build the plants, but decided to pull the plug on them after local residents objected. "Over time, it became evident that the concerns of the residents in those communities were legitimate. The government listened to those concerns and cancelled those power plants for relocation elsewhere and all of the parties agreed with those decisions," Wynne said. The opposition parties had harsh words for the Liberals after the auditor released her report on Tuesday afternoon, with one Progressive Conservative critic suggesting the premier should lose her job. "Someone’s head needs to roll and someone needs to be fired and I would suggest it be Kathleen Wynne," PC energy critic Lisa MacLeod said Tuesday. The auditor general revealed Tuesday that the premier's office promised to fully compensate developer TransCanada Energy for the cancelled power plant in Oakville, in a bid to avoid a potential lawsuit. But had the premier's office not become involved, Lysyk said, the Ontario Power Authority may have been in a position to simply wait and then exercise an option to break the contract without penalty. "We believe that the settlement with TCE will not only keep TCE whole, but may make it better than whole," Lysyk said Tuesday. NDP Leader Andrea Horwath said that result was "a great deal for a private power company and it may have helped the Liberal Party and their drive to hold on to power, but it is a disaster for the people who are stuck with the bills." The Mississauga plant was scrapped by the governing Liberals in 2010 and the Oakville plant a year later. The government announced the latter cancellation just days ahead of the provincial election in October 2011. Opposition parties have long said the government cancelled the plants in a bid to save Liberal-held seats in the Greater Toronto Area in the 2011 election. Those cancellations came when Dalton McGuinty was still leading the provincial government. On Tuesday, Wynne offered an apology for her involvement in the cancellations, as a member of the cabinet under the former premier. "As a new premier leading a new government, I pledge to you that this will not happen under my watch," said Wynne, who took on McGuinty’s role at Queen’s Park after winning the Liberal leadership earlier this year. Wynne told reporters Tuesday that since taking on the job as premier, she has sought to provide Ontarians with the facts they seek about the controversial gas-plant cancellations. The premier said this was the reason she asked the auditor general to probe the costs of the Oakville cancellation. "I asked for this report because Ontarians deserve to have a full understanding about the cost to relocate the Oakville facility," she said. The premier said her government will be introducing changes to rules about selecting the locations of large energy infrastructure projects to avoid similar problems in future. Wynne said the Liberals will also move to limit the involvement of political staff in commercial, third-party transactions.